The D617 Dambusters Squadron Memorial in the West gatehouse of the Derwent dam. 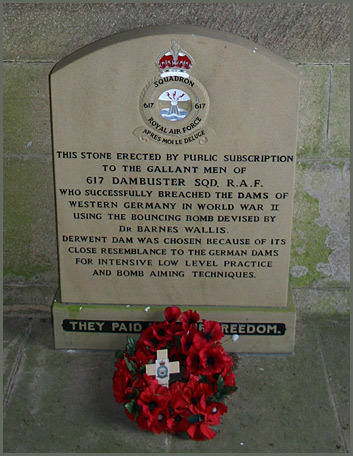 617 Dambuster Squadron Memorial is located just inside the gatehouse to the Western Tower of The Derwent Dam. Paid for by public donations on entry to the free museum in the West Tower of the Derwent dam by Vic Hallam who also successfully campaigned to have a permanent memorial to those brave and skillful men. This was unveiled on 2nd October 1986. Vic Hallam has written several good books about The Derwent Valley and its dams as well as giving illustrated talks and exhibitions. The 'Silent Valley' is about both dams and their construction and life before and during the dams construction. The 'Silent Valley at War' is about life in The Derwent Valley during 1939-1945 as well as a section on The Dambusters. Both booklet type books come highly recommended with excellent pictures and are both written by Vic Hallam, and are reasonably priced. Brief description of The Dambuster's mission as well. I have seen Vic a few times now after recognising him from a picture in one of his books that I have, however I have not had the chance to have a chat with him yet - he is a very busy and popular person! There is another memorial nearby dedicated to a sheepdog called "Tip" whose loyalty to his master never failed.